Also my first electrical, and first mod, DIY. ...where <- means left, middle, or right 510 connector is on, while the other two are off. Before I get into trying to do this with a DNA75 or DNA200, I guess I need to know if the basic setup (a battery with a switch that fires 1 of 3 atomizers, based on what position the toggle is in, is possible? I realize I have a lot to learn, and I'm willing to put the hours in. But as a creative person who no longer smokes or drinks (I quit both at the same time last month) I really need to focus my energies, and I have a mod in my head that I would love to see built in reality. welcome to the forum shawngibson. so ultimately you want to be able to toggle between three different atty's from a single dna 75/200 board, correct? would all 3 510's be in the same box as the dna board? or are you thinking on having the board and toggle in one box with umbilical cords going to 3 separate boxes that contain the 510 and fire button? keep in mind 3 separate boxes mean a long length of 510 +/- wires. that will increase the mod resistance the longer the wires are. if you were able to keep almost everything in one box (board, 3 510's, toggle and fire button) leaving out the battery (gives you more room to work with and the batt can be in a separate box as long as the wire gauge is thick enough between board and batt holder.) i'd say that would be the best route. less of a chance with resistance reading problems. Thank you, Chunky. Give me a moment or 12 to try and draw what I *really* want in Photoshop. Hopefully I can upload a pic here...BRB...must draw, then upload. Does this help...? I am not an electrician lol. that's a fine diagram. i can understand it just fine. so all these components will be inside of one enclosure? if so, yes, looks good and i don't see why that wouldn't function. if you're looking for a wiring diagram just PM me and we'll see what we can whip up! Thanks so much, Chunky. I'll PM you in the morning when I wake up. I haven't thought about the enclosure yet, I just want all of the parts to work, then I'll think of the externals. I'd definitely love your help, since I am an electrical newb. On that note, at 47 years old with a full-time job, I want to go back to college to learn about electricity, milling machines and lathes. i'm the type of guy who pulls the car over if something "electronically worth while" catches my eye on the side of the road, lol. can never have enough circuit boards/power supplies from.....anything! some important info was brought to my attention regarding your setup. 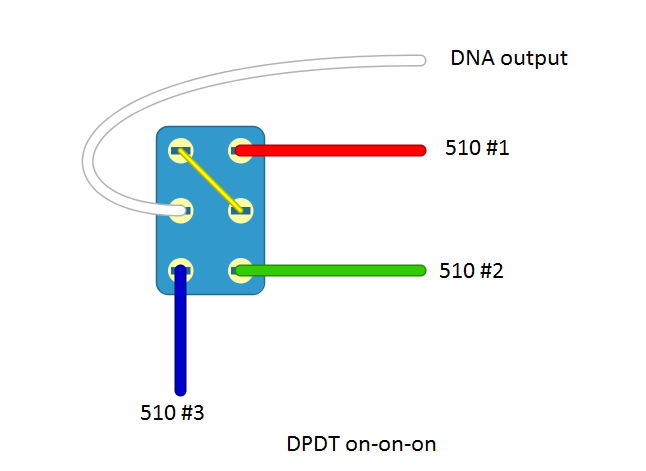 you realize if you're going to have 3 - 510 connectors connected to 1 dna board, you'll have an issue if you intend to use temp control builds. as in, switching from one to the next, hot and cold atty's, different wire types...... there is a work around tho. You will also have a lot more resistance with the contacts in the switch. Also need a switch that can handle the 30-50 amps, depending on which board you choose. Chunky, I don't expect to be doing temp builds. I eventually want to make a 3-atomizer mechanical mod (I am hoping I can use three Kick 2's?). But as I am new to all of this, I'd prefer to start building mods which are regulated, hence the DNA. Would this sort of switch meet the electrical/functionality requirements? Spiro - Does "having a lot more resistance with the contacts in the switch" mean, for example, that a 1 ohm coil will no longer function as such? If so, how can I compensate? Thanks guys, I'm really looking forward to this! The added resistance for the switch would mainly affect temperature control. If the switch and wiring added 10 milliohms that is nothing for wattage mode but in TC mode it could be hard to compensate for because the resistance might change every time you flip the switch. You could also use a SP3T rotary switch, much like Phil B "lazy box". thanks for helping out Spiro...... you won't see me making nice, legible diagrams. my microsoft paint skills are just terrible, lol. According to an online calculator, this should handle 100 amps at 12V DC? Yes? It IS huge though lol! (On)-On-On means it is momentary in one position. I cheated. Found an image on the internet, then edited it.